A Save the 76 Ball campaign aims to preserve the former gas station mainstay, designed by Ray Pedersen. Pedersen, who lives in Bellingham, first displayed his creation at the 1962 Seattle World's Fair. Pedersen gases up at this station in Tulalip, coincidentally one of the last gas stations in the U.S. with one of the icons. Stopped at a traffic light two blocks from her Los Angeles home, Kim Cooper stared at the 76 gas station she has driven past hundreds of times and tried to figured out what was wrong. Then she got a terrible, unsettled feeling. "I'd always remembered seeing a big, beautiful 76 ball," she said of the '60s-era rotating sign that had illuminated gas pumps across the West Coast and at her neighborhood gas station. "And they had replaced it with this flat sign and a color that looked like a slab of raw liver." A Web search informed her that the balls had begun to come down three years earlier, in 2003, a few years after Unocal sold the brand to Tosco Corp., which then became part of ConocoPhillips. Color experts hired by the company said the orange balls didn't fit with the company's bright red and white designs. Cooper never met Ray Pedersen — the Ballard High School graduate who designed the orange 76 ball and debuted it at the 1962 Seattle World's Fair — but that day launched a Web campaign to save a slice of Americana that was quickly vanishing from the nation's landscape. Cooper's online petition has attracted about 3,000 signatures and recently persuaded ConocoPhillips to change course — installing about 75 newly painted red balls in high-traffic locations in California and saving about 30 of the old orange ones for museums. Even the Smithsonian's National Museum of American History is considering adding a 76 ball to its collection, a spokeswoman said. "I got a call about that, and I said, 'You've got to be kidding,' " said Pedersen, a 1944 Ballard High School grad. "But it's been out there for 45 years, and it's become part of the American psyche. It's an icon, right?" Pedersen, 80, studied business at the University of Washington, and in 1954 was hired by Young & Rubicam, a Los Angeles company that designed Union Oil's advertising. Union Oil's circular orange logo with blue letters had been used for more than a decade when Pedersen was hired, and the company wanted to establish itself as the gasoline leader in Los Angeles, which is still North America's largest gas market. In late 1961, after Pedersen designed several successful print and TV ads, his boss sent him to Seattle with an assignment to create advertising for the 1962 World's Fair Skyride, sponsored by Union Oil. The Skyride, now used at the Puyallup Fair, traveled from the northeast corner of the fairgrounds to a second kiosk 1,400 feet across. Pedersen's boss expected typical, square signs near the boarding kiosks. "But those flat lollypop signs were boring," said Pedersen, who awoke one night with a vision. Pedersen knew hundreds of people would be waiting in line and wanted a sign they could see from all angles. He designed murals, showing people where they could go with Union Oil and complementing the ride's brilliant reds. But he needed something that would stick in people's memory. "You know how you wake up in the middle of the night?" asked Pedersen, who lives in Bellingham. "It was like that — and I had this idea of a big ball." When a Union Oil senior vice president saw the 8-foot globe installed a few days later, he said it was the best sign he'd ever seen. "We've got to put one of these on every station we own," Pedersen recalled him saying, adding that the vice president, who later became CEO, initially ordered about 3,000 balls for stations in 13 Western states. It's been reported that the numbers peaked in 1969, when more than 18,000 gas stations in 37 states had 76 balls. Pedersen, who handled the Union Oil account for 12 years, said it seemed natural to follow the station balls' success with replica antenna toppers. Millions of the toppers traveled the world and spawned dozens of competitors. Kim Koga, executive director and curator of the Museum of Neon Art in Los Angeles, remembers one on her family's Volkswagen Squareback in the late '60s. She also remembered the unique artistic value of the illuminated, rotating station balls. "It was kind of minimalist in shape and the writing and the color," she said. "It shouts '60s orange and was such a popular part of the American landscape, we had to save one." But it wasn't easy. Letters and e-mails went unanswered by ConocoPhillips, which didn't want to discredit its trademark and brand by distributing the old balls. Koga tried for months to track down a ball — even contacting a Los Angeles company she knew had helped take them down. Finally, last week, after months of discussions with ConocoPhillips, the company said the museum could own one. "We were pleasantly surprised that we had underestimated the affection that people have for the orange 76 ball, so we decided it would be a good thing to set aside about 30 vintage orange balls so they could be viewed in public arenas such as museums," ConocoPhillips spokesman Phil Blackburn said. The Museum of History and Industry in Seattle received an e-mail from ConocoPhillips asking if it was interested in acquiring a 76 ball, spokeswoman Mercedes Lawry said. Museum officials thought it was an interesting artifact, but didn't see how it would fit with its mission, she said. After finding out that a local man had designed it for the World's Fair, Lawry said the museum might reconsider its assessment. The switch to more modern red and white designs came after surveys showed that customers preferred well-lit, bright gas stations, Blackburn said. While ConocoPhillips plans to install new red 76 balls at California stations, no plans for new balls in Washington have been made, he said. And the orange balls continue to come down. 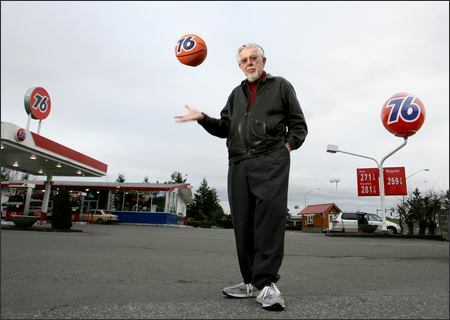 Cooper, an author and cultural historian, knew of only one 76 ball that remained in Western Washington — at a station in Tulalip off Interstate 5's Exit 199, coincidentally where Pedersen buys his gas. However, the ball has been painted red, and neither a station employee nor Blackburn knew when the change occurred. "Orange is a color you can own, and Union Oil did," Pedersen said, standing under the sign this week. "That's probably why they picked it in the beginning. For years, when people saw orange they thought of Union Oil. "Now it's gone to a liver red that is almost like McDonald's. They're making a huge mistake." Cooper said it would also be a mistake not to save one of the balls for Pedersen — the Seattle native who designed the icon of American motor culture. Blackburn said the balls are "absolutely not for sale," despite dozens of requests from collectors, including "Reservoir Dogs" star Michael Madsen. "It is important that the brand be protected," Blackburn said. "Though there may be a historical case to be made to consider an individual collector if the circumstances and criteria can all be worked out to mutual satisfaction." Where Pedersen might put it? That's still in question. "I live in a community with a bunch of Republicans that have their flags up," said Pedersen, a self-proclaimed liberal veteran. "I said if I get a ball, I'll put that up on a pole, see what they think about it." Size: The first sphere was 8 feet, Pedersen said. Where it was: In 1969, more than 18,000 stations reportedly had 76 balls. Dodger Stadium also had a 76 ball, and the gas station sign spawned millions of replica antenna toppers. P-I reporter Casey McNerthney can be reached at 206-448-8220 or caseymcnerthney@seattlepi.com.